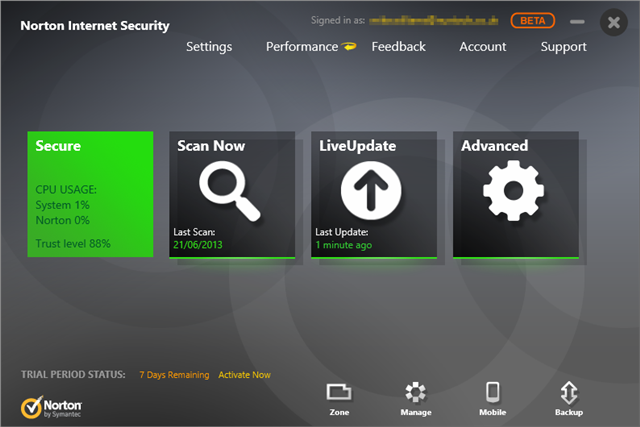 Symantec has unveiled the first public betas for Norton AntiVirus 21, Norton Internet Security 21 and Norton 360 21.
then navigating the new builds should be straightforward. stable, and able to carry out basic functions without problems. However, there are also some areas which aren’t yet available at all. largely blank dialogs with messages like “Security settings here”. (you can download a new build and activate that to repeat the process). with this offer, close to the official product release date”. and Norton 360 21 are available now.